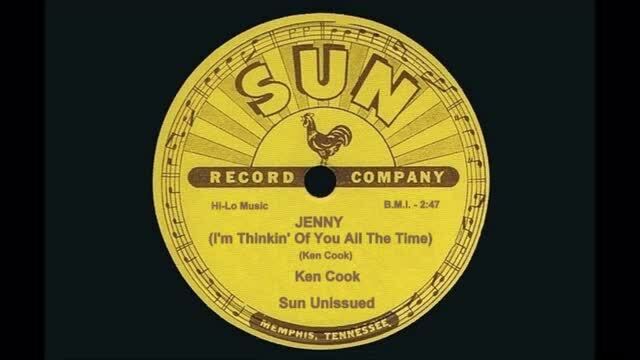 Ken Cook was primarily a rockabilly singer and pianist is almost completely obscure, born on May 13, 1937 at Ranger, Texas, but on his only country recording here on this session at Sun he also adapted a country song and the old Carter Family favourite ''I'm Thinking Tonight Of My Blue Eyes'' is transformed into a tribute to ''Jenny''. All we know is that Roy Orbison brought him from Texas to Sun Records. Cook had an almost astonishing vocal similarity to Roy, and Sam Phillips was persuaded to issue one single by him on Phillips International. For his part, Orbison always refused to talk about Cook, leading to speculation that maybe Ken Cook was bonking Roy's girlfriend, Claudette while Roy was on tour. Ken Cook's "Problem Child" was recorded on September 4, 1958 that also produced Ken's first single ''Crazy Baby'' b/w ''I Was A Fool'' (PI 3534) for Phillips International. To that point, Roy's version of ''Problem Child'' hadn't been released. Ken Cook died on April 27, 2004.